Several games can be opened at once. Once a game is open, you need to double-click on it to activate it. To save a game, use the **''Save''** icon in the ribbon or press ''Ctrl-S''. Double-click on **''Images''** to open the [[edit_image|Image Bank]]. To add a scene, right-click on **''Scenes''** and choose **''Add a scene''**. Double-click on a scene to modify it in the [[gdevelop:documentation:manual:editors:scene_editor:edit_layer|Scene Editor]], or right-click it for more options. To modify an external event, double-click on it, or right-click for more options. 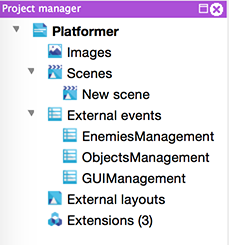 From the Project Manager you can modify the game parameters and access other editors. You can create a new game by clicking on the New button in the ribbon, or by pressing Ctrl-N. A window will popup to let you choose a file for your new project as well as a template ( You can also choose to start from an empty project ). You can close a game by right-clicking on it in the Project Manager and choosing Close this project, or by pressing Ctrl-W. Right-clicking on an item in the Project Manager will activate a menu: from there you can modify other settings, like the game parameters or the global variables. A game is composed of scenes: the first scene in the list will be launched first. External events are events which are not directly linked to a scene. They can be included to one or more scene using Link events. To add an external event, right-click on External events and choose Add external events. To modify an external event, double-click on it, or right-click for more options. External layouts are objects which are not directly linked to a scene. They can be dynamically created on a scene using the appropriate action. It can be very useful to load a level into a scene ( See example “Multiple levels with external layouts” ). To add an external event, right-click on External layouts and choose Add an external layout. Extensions allow to add, extend and simplify GDevelop creation capabilities. Double click on Extensions to choose the extensions to use in your project.